"I with my 11 years will now have been hosting one of these Sunday talk shows longer than any of the other guys." Here’s the really depressing thing: I figured out when I saw his announcement…that will make me the dean of the Sunday morning talk show hosts, because I with my 11 years will now have been hosting one of these Sunday talk shows longer than any of the other guys. And initial speculation on Schieffer replacements shows the options are heavily, heavily tilted toward guys. 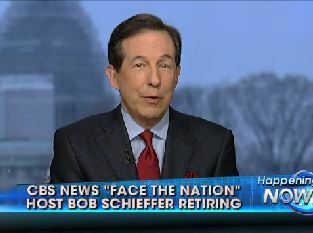 Check out our sister site TVNewser for a roundup of Schieffer tributes.